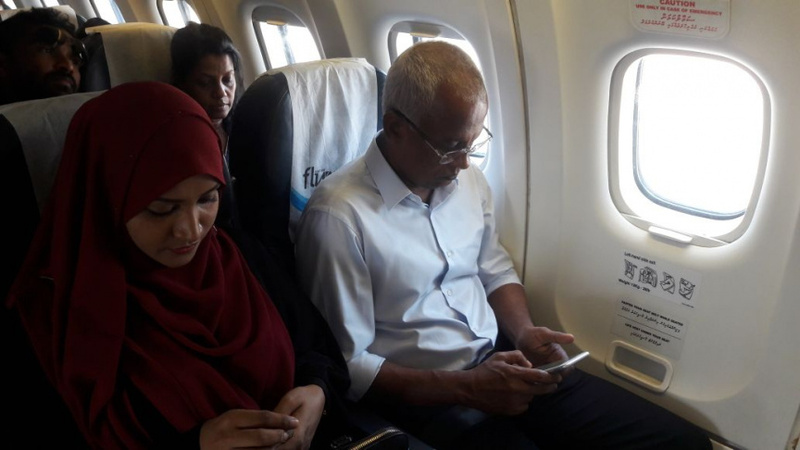 (From L-R) Jumhoory Party's council member Aishath Nahula and opposition's presidential candidate, MP Ibrahim Mohamed Solih (Ibu) on a plane to B. Atoll on July 28, 2018. Opposition coalition’s presidential candidate, Hinnavaru MP Ibrahim Mohamed Solih (Ibu) has left for a tour of B. Atoll. Ibu left for the campaign tour this Saturday morning. It marks his first campaign tour since the official acceptance of his, and his running mate, Faisal Naseem’s candidacy by Elections Commission. Ibu is scheduled to visit several islands in B. Atoll. He will also participate in a function held for the citizens of B. Dharavandhoo on Sunday night. He will return to the capital, Male’ City, on Monday. Ibu is joined in the campaign tour by senior officials from Maldivian Democratic Party (MDP), Jumhoory Party (JP), Adhaalath Party (AP) and the Maumoon Reform Movement, including JP’s council member Aishath Nahula. Speaking to press at the airport before embarking on his tour, Ibu said he will announce the Jazeera Manifesto, compiled with input from the opposition political parties, within the next two days. He also said he will address some of the components of the manifesto during his tour of B. Atoll.